There are so many games that come out of the gate with fantastic ideas, original concepts, and tons of potential, but fail to make the grade due to a lack of budget, time or talent. We've seen far to many Mindjacks, Damnations and Dark Voids over the years, and it's more than a little depressing. Binary Domain had all the hallmarks of one of these games. While it promised an absorbing story that posed questions about human emotion, and while it featured intriguing voice recognition technology, early looks at the game revealed wash-out graphics and bog-standard gameplay. In short, it looked like the next Mindjack -- lots of ideas, terrible execution. Imagine my surprise when it turned out that Binary Domain looks great, plays well, and is a pretty damn fine title overall! Binary Domain is yet another Japanese game based around mainstream Western design, a cynical idea that usually leads to terrible abortions such as Quantum Theory. Yet this cover-based squad shooter bucks convention and delivers something not only competent, but fun and original. In a distant future where rising sea levels have destroyed much of the old world and sent the wealthy into sprawling aerial cities, robotics have taken center stage as the most important scientific endeavor. Needed to replace the millions left behind in flooded slums, robots have been used to serve, build, and police the streets, leading to a series of strict worldwide rules about their creation. The most important rule is Clause 21 of the New Geneva Convention -- robots cannot be indistinguishable from humans. So guess what happens! 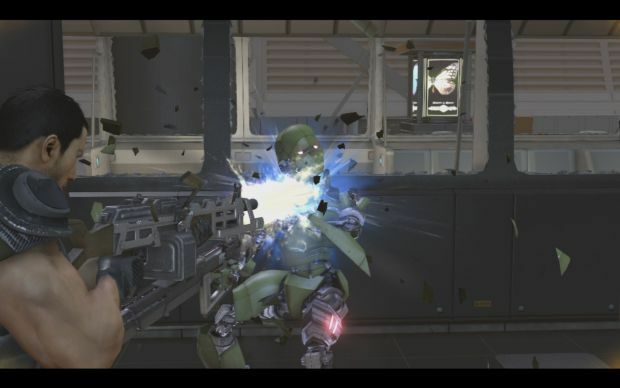 Binary Domain's plot never gets in the way of the action, and while it certainly throws up some interesting ideas in the same vein as A.I. Artificial Intelligence, it doesn't ever gain a huge amount of steam, feeling rather bolted onto the side of the experience rather than fully integrated. It doesn't help that Binary's story does too good a job of making the humanoid robots sympathetic, so that by the time the bad guy revealed his end game, I was on his side. Still, it's a plot propelled by a genuinely likable squad of sarcastic soldiers, and full of bizarre twists that could give even Hideo Kojima a run for his money. 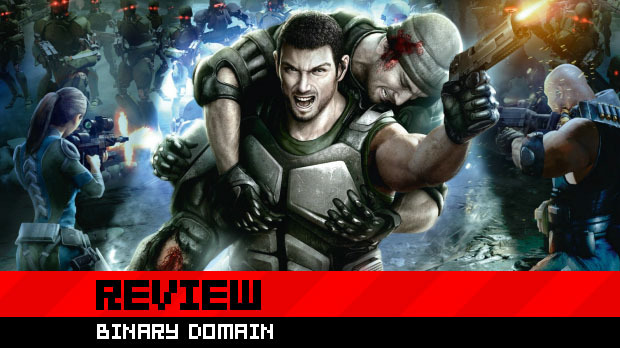 The bulk of Binary Domain is focused purely on cover-based combat, and it does a fine job of it. 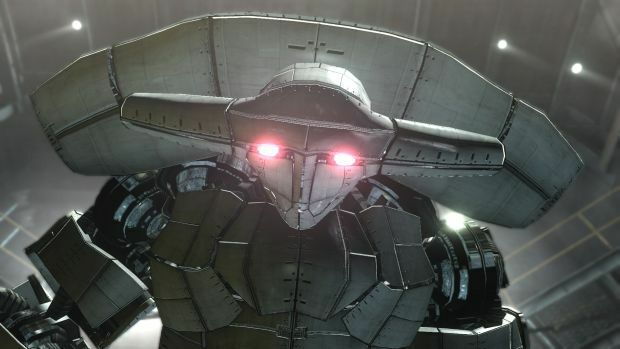 The enemy forces are made up of various robotic soldiers, which has allowed Yakuza Studio to get away with masses of brutal, sadistic, limb-shredding violence. Every opponent in the game suffers procedural damage when hit, as armor is ripped from appendages and body parts are blown away. Careful shooters can take down a robot's legs to make it crawl creepily on the floor, shred away arms to reduce combat effectiveness, or even pop off a head and cause the body to blindly fire at its teammates. There's something undeniably cathartic about facing off against an army of robots and systematically reducing it to a pile of scrap metal, taking each individual apart from bottom to top. Were the enemies human, this game would be banned, but the bots make it all okay. It's a good thing that the combat is consistently exhilarating, as it rarely changes things throughout the entire game. Those with a low threshold for repetition will get tired of the similar combat scenarios that occur from beginning to end, and while the boss encounters are huge and explosive, they are all fairly simplistic battles where one must find a blatantly glowing weak point and blast it. Still, those that just want to kill things and don't care much for variety will have a great time blowing the legs off of gigantic mechanical spiders. 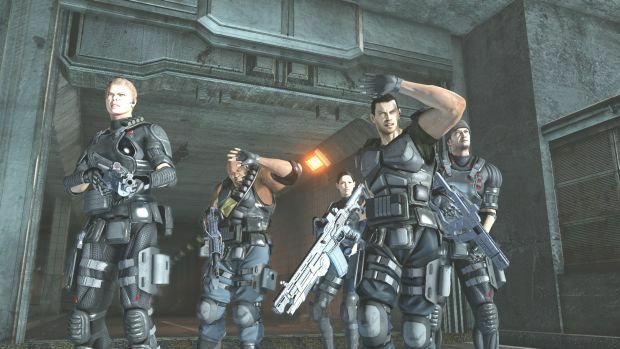 The big gimmick with Binary Domain lies in the interactions one has with the squad. Players step into the shoes of Dan Marshall, and he'll be typically joined by up to three other team members. While the A.I. partners are quite adept at fighting autonomously, their effectiveness is enhanced when Dan gives them direct orders in keeping with their particular skills. For instance, Rachael is a demolitions expert an it's a good idea to send her into close-quarter combat where her shotgun is most effective. Meanwhile, Big Bo is skilled at distracting enemies, drawing their fire and allowing the rest of the team to flank. None of these tactics are especially intricate, but they can make the difference between a pitched battle and outright humiliation of the opposition. These commands can be dished out using a limited menu of options, but Yakuza Studio doesn't want you to do that. To access a wider range of interactions, players can plug in a headset and directly speak to the squad. The A.I. can recognize voice commands and responds to your every command. At least, that's the idea. In practice, voice control is very much a hit and miss affair. Incredibly simple statements such as "Yes" and "Fire" are usually recognized without a hitch, but it becomes pretty messy when you're trying to get individual squad members to do specific things. For instance, it's very hard to get your team to regroup, since "Regroup," will often be translated as "Shoot" or "Retreat." Allies also seem to struggle with the word "No," which can be turned into any number of other statements. Still, the system is quite remarkable when it works, and it's also rather amusing to constantly tell Bo you love him, or call Faye an idiot. The more your allies trust you, the more likely they are to obey orders. If you constantly insult someone or give them bad commands, they may stubbornly refuse to fulfill your requests in future battles. There are also regular occasions where a partner will open up dialog with Dan, and your responses will influence their feelings toward him. While that's an interesting concept in and of itself, it almost always boils down to you letting the character speak, then saying "Yes" to everything. Binary Domain is a game with a simple message -- blindly agreeing with people is the only way to get popular. That's a better message than the other one it sends -- that "No" doesn't mean "No." It's worth pointing out that I was using a standard 360 headset. There may be better results with higher quality microphones. Also, while it might be possible that a British accent on an NTSC version of the game could have confused the game, I find it highly doubtful due to the fact that the commands are mostly one or two syllables consisting of generic words. 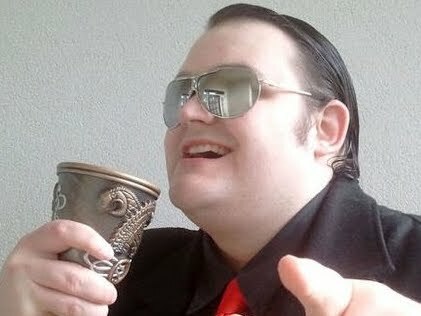 Also, I don't come from Scotland or anywhere else with a truly demented accent. While the voice commands are rudimentary and only work half the time, Binary Domain wisely refuses to rely on the gimmick completely. The game can be quite adequately played without a headset, using contextual commands from a menu, and whether you're giving orders or letting them fight freely, the A.I. partners are shockingly good at what they do, able to hold their own in combat and keep each other alive. 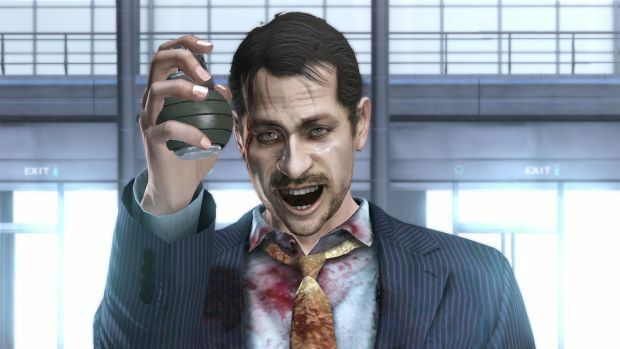 It could have been so easy for Yakuza Studio to utilize the voice input like a crutch and let the rest of the game slide, but Binary Domain concentrated on being a good shooter first and a tech demo second. It's a rare attitude these days, but an incredibly welcome one. Store kiosks littering each level can be used to buy ammo, reviving med kits, and nano upgrades that occupy upgrade grids on each character's personal menu. Weapons can also be upgraded with incrementally expensive boosts to power, fire rate, reload speed and ammo capacity. By far the best reason to use a store is to access the sweet selection of grenades on offer. From holographic distractions to chaff explosives that confuse opposing robots, there are many cool grenades to choose from. Outside of these extras, and a single level revolving around poorly-controlled jet boats, that's all there is to Binary Domain's campaign. You move, you take cover, you issue commands and shoot. When you strip away the gimmickry, there's really nothing you haven't seen before, but Binary Domain does it all surprisingly well with a sense of style that only Japan can pull off. Enemy robot designs are absolutely fantastic, especially the abstract boss machines, and every level has a tremendous sense of fast, consistent pacing that ensures things are never boring. You'll likely get a solid eight hours from the solo campaign, but if that's not enough, Binary Domain provides some multiplayer options. 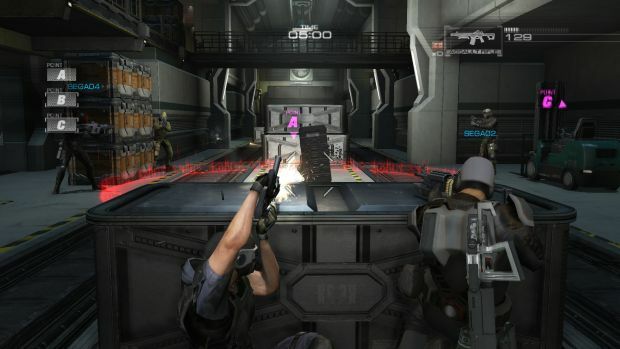 The competitive multiplayer features a range of bog-standard modes, including team deathmatch, capture-the-flag, and area control, across a limited selection of small maps. It performs its appointed task, not really doing anything spectacular but providing enough shooting action to chew up a few spare minutes. It clearly wasn't the focus of development though, given how limited it is, and how the small maps feature a handful of predictable spawn points that ensure one team can easily ambush the opposition every time a player resurrects. There's an experience system and a small range of stereotypical classes such as scout and heavy gunner, and each kill on the battle awards points that can be spent on temporary new weapons and med kits. Still, these are just ancillary distractions on a mode that I doubt many will be playing even a month after launch. Same goes for the wave-based survival mode that has also been bundled in. I like a good survival challenge, but this is about as basic as it gets. A tiny selection of restricted maps, and then an endless stream of robots that get surprisingly brutal almost instantly, bringing out shields and heavy firepower after just the first wave. Tough as it may be, however, it's not very compelling, and instantly forgettable. This is most certainly a game one buys for the campaign, and not the online features. Binary Domain may not be a trailblazer, but it's a damn good follower. Perhaps the best attempt at "Western" shooter gameplay from a Japanese studio, this robot-carving romp keeps up an exhilarating level of fast-paced combat from beginning to end. While the voice commands are a crapshoot, they're fun to play with and the game doesn't rely on them to work, focusing first and foremost on pure mechanical conflict with some gorgeously designed electronic opponents. All of this bundled up in a unique story that is so confident in its ideas that you barely stop to question how silly it actually is. In short, it's a game that eludes the trap that so many similar games have fallen into, and it's well worth jumping into.